Here I continue covering everything about Java. 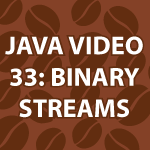 Today I completely cover reading and writing Java Binary Streams. I cover everything you need to know including DataOutputStream, FileOutputStream, BufferedOutputStream, all of the reading and writing primitive type methods and more. All of the code follows the video. It is heavily commented. nice as usual , thanks for sharing with us. sorry i pasted some wrong code in html, dont mind bro, i linked those tabs but im just unable to use jquery to slide those tabs. I’m better now. I’ll put up another tutorial tomorrow. hey what about serialization(object input and object output stream), are you going to teach that also, because what if i want to transfer data over the network.? Just found this series, nice and compact. Very well produced. Thanks for sharing. How did you add the arguments to the constructor properly after copying them without including the access modifiers. And how did you initialize them inside the constructor,, you made the first two and the rest modified immediately..
Is there any reference to it..
is it eclipse tricks… I am using netbeans.